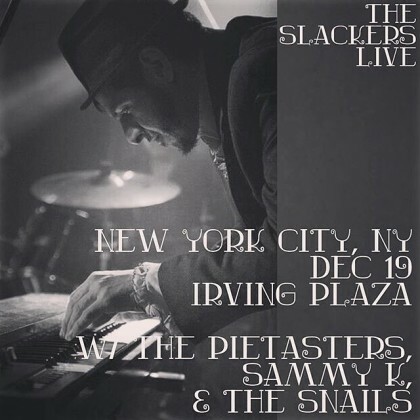 Tonight, join us for the annual Slackers Holiday Show! This year features the Pietasters (who I hear will be combining with the headliners in a special way), The Snails, and Sammy Kay! I’ll be on the turntables between sets all night. Ask me for details about DJ Mush-1‘s Al Paragus headquarters in Flatbush for a party that goes til dawn afterward. Happy holidays! This week, I’m packing a one-two punch of gigs for Thursday and Friday. 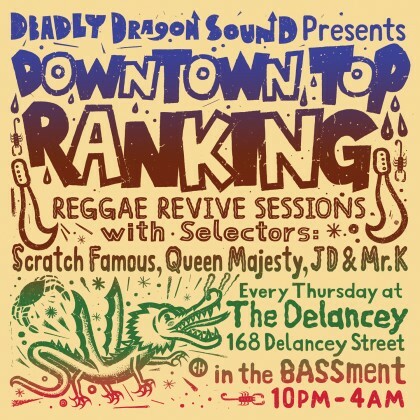 First up, I’ll be joining Deadly Dragon Sound at Downtown Top Ranking in the basement of the Delancey. Expect heavy roots, some digital 80s stuff, and a few surprises in the deepest part of the night. 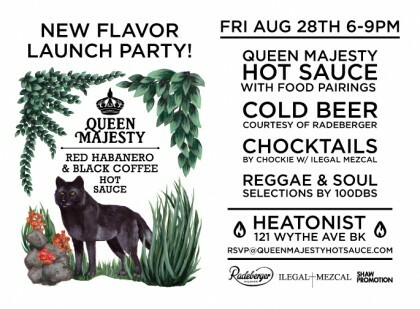 Friday, I’ll be playing a bunch of soul, funk, reggae, and other oddities at Queen Majesty‘s launch party for her brand new hot sauce flavor: Red Habanero and Black Coffee! I’m very excited, as a longtime fan of her original Scotch Bonnet & Ginger flavor. Come to the Heatonist shop in the early evening for spicy treats and cocktails, and stay for the music. We’ll be partying til 9pm. This is by far my favorite part of the summer, when the city empties out a bit and the weather feels more like New Orleans than New York. I don’t have to wait too long for a drink at the bar, because the students have gone home and the old folks have gone up to the Hamptons. 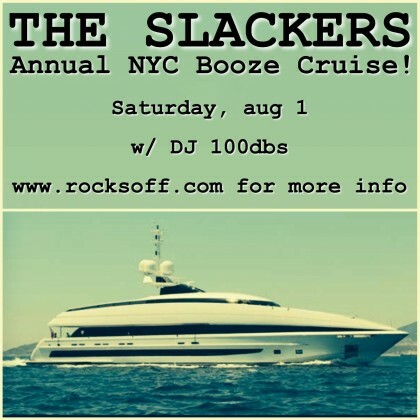 The fanciest thing I do each summer has traditionally been the Slackers Booze Cruise; it’s hard to believe it but my first time DJing this gig was about nine years ago. Well, time flies, and here we are again with what looks to be a bigger boat. Unfortunately, Agent Jay got into a bike accident about a month ago and won’t be able to play guitar at the gig. The silver lining is that he’ll be joining me on the turntables instead, helping me provide the soundtrack between sets. Join us on the boat and take in the fantastic views of Manhattan! It boards at 6pm sharp and leaves at 7pm, so don’t be late. Get your tickets here. 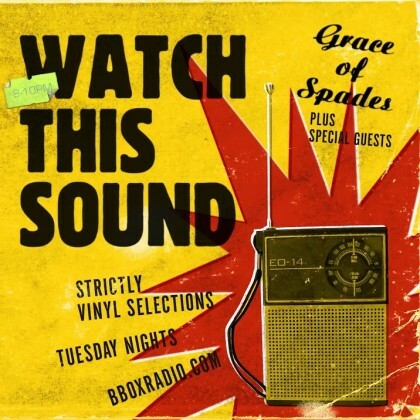 The Tuesday before that, I’ll be on BBOX Radio once again with Grace of Spades, from 8 til 10pm. Tune in at bboxradio.com and get at me on Twitter for requests. The Swamp will be closing its doors soon. If you know where it is, you should probably attend one of the last shows happening there. 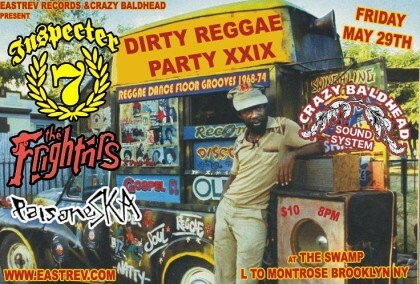 Join me and the Crazy Baldhead crew this Friday for another crazy night at this punk loft! 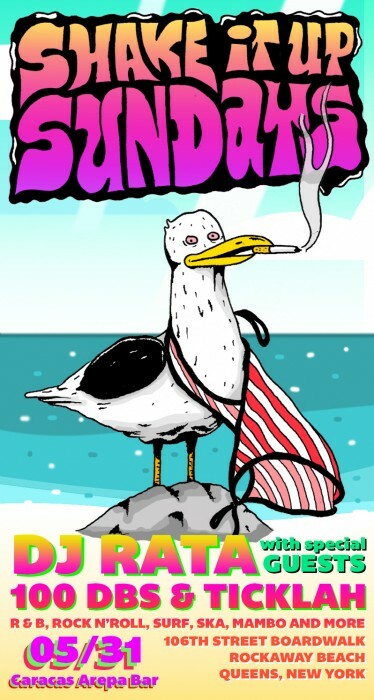 Beach season is back, and my buddy Rata asked me to help him kick off the first Caracas Rockaway party of the season. Unfortunately, despite what the flyer says, Ticklah won’t be present because of a conflicting commitment. But Grace of Spades is stepping in to pick up the slack! Hang out on the boardwalk with us until sundown – I dare you to resist the delicious arepas they serve. 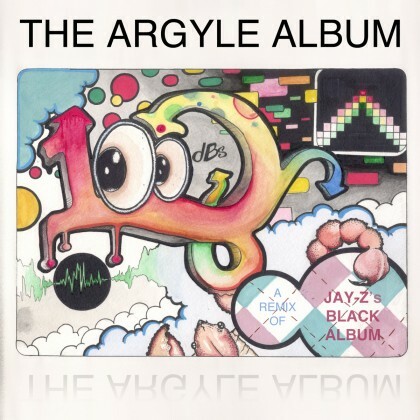 Ten years ago on this day, I released The Argyle Album. There were literally hundreds of producers attempting a full-length remix of Jay-Z’s Black Album at the time, mainly because he made such a production of releasing the acapellas, and hinted at his retirement from the rap game. It was an interesting cultural phenomenon that gained a lot of steam once Danger Mouse released his now-infamous Beatles mashup album, The Grey Album. The other two I remember distinctly, and fondly, were Kev Brown’s Brown Album and Kno’s White Album. I was a bit late to the game; most of these remix albums came out in 2004, and mine dropped in 2005. However, I don’t think there’s a more accurate reflection of the wild and weird influences in my head at that time. I don’t have a lot of photos, or journal entries, or letters from that time in my life. But I have this document that reminds me of all the different ways I was listening to music as a college student. Digital production has changed so much over the last decade. At the risk of sounding like an old man, I’m gonna say I remember having to push and pull the acapellas around a lot. Time-stretching was pretty new then, and not quite reliable, especially in terms of flow in rap vocals. A lot of times you have to force a phrase to fit on a beat if it’s not really the same “feel” as the original, even if they’re the same exact tempo. Being a DJ certainly helps with this in the studio, but tools like Ableton’s “warp” function make this a much simpler task now, as opposed to the agonizing methods I had to use then. I swear, half of the time I spent working on the album was moving acapellas around. The reason this release (my first full length production under the name 100dBs) was so pivotal for me is because I effectively learned how to chop samples by making it. Previously, I had been synthesizing almost everything from scratch. I was listening to a lot of classic hip hop at the time: Gang Starr, A Tribe Called Quest, De La Soul, Nas, and all of the other usual suspects. I listen to a lot of different rap, and more generally a ton of different music, but NYC hip hop became the blueprint for what I loved about production at the time. 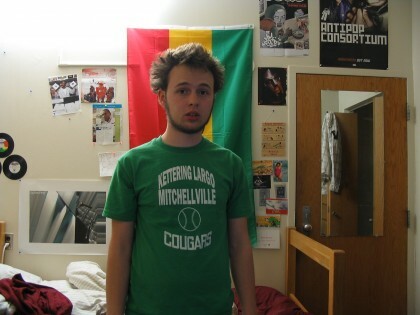 I didn’t really get heavily into rap until college, and I had been listening to reggae and dub since I was a young teen. That backdrop definitely looms large in combination with the hip hop influences on this album, and was carried forward in my two releases with Ryan-O’Neil. I think this little intro was actually one of the last things to get finished. I had recently picked up a copy of Seals & Crofts’ Greatest Hits LP, probably at a dollar bin in the College Park CD/Game Exchange. Shout to Jeff and Isaac who used to work there and hook me up with tons of cheap buys. Anyway, I was needle-dropping on the record at home, and I remember having this moment where I realized “Summer Breeze” was actually a really dope tune, but I didn’t wanna take it wholesale. I always loved the horns, so I chopped those up one afternoon. It was only after I finished the arrangement that I came up with the samples that kick off the album. The vocal snippets are all references to landmarks in my life: “home of the Terrapins” (University of Maryland), Israel (where I was born), and Long Island (where my family moved when I was just one year old). The radio fuzz and static were just samples I took from my own tuner. Prince Paul (widely credited as being the inventor of the hip hop skit, for better or for worse) was a huge influence on me. I also became fond of the way DJ Premier and Pete Rock used short instrumental beats to break up rap albums a bit. This was basically my attempt to do something along those lines, relying heavily on an existing KMD skit. This one was pretty straight-ahead. I don’t remember much besides programming the 808-style drums, and that I had to tweak the “feel” of his vocals a ton to get em to sit right on this track by Fischerspooner. I always loved the lyrics on this track, so I think I took extra time to give it the proper treatment. The main portion is “Yellow Calx” by Aphex Twin. It’s reversed, and I almost like it better that way. I programmed these drums, and there’s a few synth parts in there too – I just tried to complement the vague melody that permeates the Aphex sample. The reggae drums in the background come from an old Upsetters dub, and the piano is just some random part I played and sampled. I was getting heavy into old Modest Mouse around this time; there are actually two of their tracks in here. A short snippet of Isaac Brock singing “Cowboy Dan’s a major player” is buried at the beginning, and the main loop is from “Heart Cooks Brain.” I don’t think I had to add much of anything drum-wise, but there’s some weird fuzzy synths overdubbed on this. Yes, this one is basically just “Kid A” with some mediocre cutting and added percussion. If memory serves correctly, I had to re-pitch the vocals to get them vaguely on key. Super simple to make, but I like this one a lot. “Arch Carrier” is one of my favorite Autechre tracks, and it knocks hard without much help. I added an arpeggiated synth in the same key, but besides some light editing and key shifting, this track is basically a blend. I had been listening to Choking Victim since high school, and the minimal drums and bass on the intro of this track were too irresistible for me to ignore. I built the track around that basic loop, and spliced in the breakdown for no real reason. Another one that’s effectively a mashup, although I programmed a synth at the end. I don’t wanna brag, but I sampled this particular King Crimson song a full five years before Kanye West did. It’s a ridiculous guitar riff that’s hard to forget once you hear it. I doubled the melody on weird modular software synth I patched up. I absolutely hated the hook on this song, so I had to find ways to complete the verses. This involved doing a cut or fade before the last line in most cases, or completing the line with a sample that rhymed. For example, one was a snippet from “The R.O.C.” (a totally unrelated Jay-Z track). That bit at the end is some random Lee Perry interview. The first time I heard The Cure’s “Lullaby” I immediately thought it would make a great sample for a rap track, with some drums to beef it up. I really like the way this one turned out. 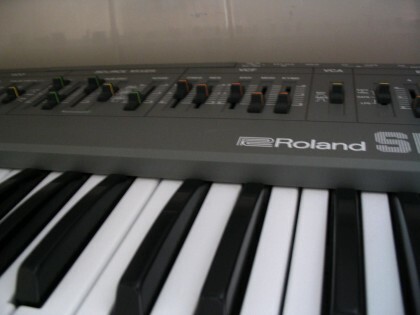 There’s some subtle synth work here too, and the cymbals are from “Alberto Balsalm” (another Aphex Twin sample). Fun fact: I later used that whole track for a mashup featuring Snoop Dogg. Sample nerds: there are levels here, and this is kind of a weirdo mini-skit in front of an actual song. The original Jay-Z track (produced by Kanye West) features a sample of Max Romeo’s Chase The Devil. From some mixtape I can’t recall, I ripped the intro where they’re talking about that sample. Prince Jazzbo’s version of that track, “Croaking Lizard” is one of my favorite deejay tunes, and drops shortly after this; I sampled this later on again. You can hear The Upsetters’ “Jungle Lion” (itself an interpolation of Al Green’s “Love and Happiness”) playing in the background leading up to this moment. Then, finally, the track unfolds around a sample of “Long Sentence” – also by the Upsetters, and sped up just a bit too much. That’s a lot of Lee Perry samples, but what’s even more ridiculous is that the original version of this remix was built atop his “Noah Sugar Pan” dub. Another reversal, and another Radiohead sample… this is “Like Spinning Plates” – but it’s definitely reversed. The first time I heard their recording, I got curious about what it was before they reversed it, and I saved an edit of it. I used to listen to it more than the album track. This is one of my favorite remixes on the album, and it’s essentially me trying to sound like Timbaland. There’s a lot of drum and synth programming on this, and I remember finishing it in McKeldin Library on my laptop, just as its battery was dying. This was one was so tough to get right! 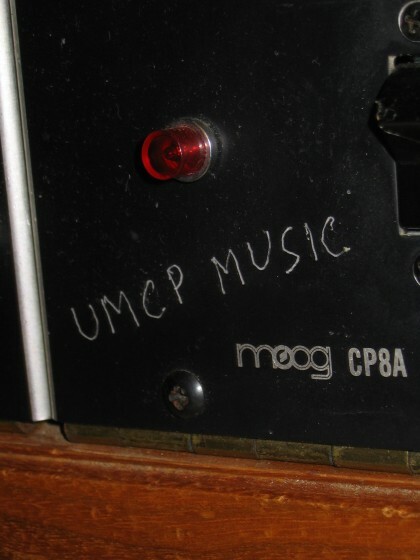 It’s in 6/8 time signature, and I remember feeling at the time that a lot of other producers phoned this one in. I won’t name anyone, but there was one popular remix album where this track was literally just random noises. Dude didn’t even try to make a beat for it. It eventually became clear to me that somehow, beatmakers weren’t caught on to the fact that this wasn’t in 4/4; there were lots of producers who just didn’t know anything about basic music theory. I also heard a lot of remixes that were attempted in 4/4 time, all of which were even worse than the brazen non-attempts. I tried to really nail the flow and feel of this one with dirtied-up samples of 60s legends The Zombies. There’s one track I didn’t touch at all: “Moment of Clarity.” I just didn’t like it. I thought the hook was wack, and it just never sat right with me. Other than that, I really tried to give each track its own personality. Many of them started with different beats entirely that I ended up trashing. Overall, The Argyle Album was an eye-opening experience that sharpened my studio techniques, and laid the foundation for everything I worked on after it.